Login sessions, jam sessions, class sessions, negotiation sessions, and traditionally, in Britain, drinking sessions- a set time in the day for socialization, usually in a pub or somewhere of the sort. Leave it to the civilized Brits to schedule fun. Ready…go! During session drinking, the goal is not to get sloppy, just to throw a few back and enjoy the company of those around you. Beer is expected to be a common choice when sipping for a length of time while remaining sober and steady. There are wines capable of playing this game as well. “Session wine” is an idea that was introduced to me earlier this year by a friend in the industry. A low alcohol level (12.5% or below), food friendliness, and an overall quaffably innocuous character are important in identifying a session wine. Preferably in a pleasant way, and this is very possible. 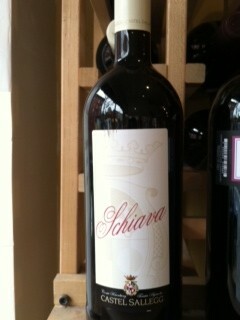 When I think of session wine, I think of schiava (“ch” pronounced with a hard “c”). The schiava grape (sometimes called trollinger or vernatsch depending on where and by whom it is grown) is one of Italy’s hundreds, and is native to the Dolomite Alpine areas of Trentino and Alto Adige. Schiava’s homeland has undergone a considerable amount of centuries-long political turmoil, going back and forth between Italian and Austrian ownership. The region is now legally Italian soil, but spiritually remains very Austrian-German in its customs, language, and cuisine. Situations of this nature can be found throughout Italy, but that is a story for another day. The thing to note here is that at the core of it, a grape is a manifestation of its terroir, not its nationality. The schiava vine is vigorous, yielding many grapes per bunch. Its skins are thin and produce a wine that is pleasingly light in body and low in alcohol, with a noticeable yet not-too-present acidity. Its color can often be so pale a red that it is commonly mistaken for rose when in the glass. Overall it makes a pretty wine, with cranberry and rhubarb notes, and a sometimes earthy character. It is delightful when served slightly chilled. Schiava is so commonly consumed in Trentino and Alto Adige that it is often referred to as a “tavern wine”. I have it on good authority that this wine can be drank all. day. long. The schiava pictured here is produced by Matthias Hauser, enologist at Castel Sallegg. Its grapes are harvested from the Bischofsleiten vineyard. Bischofsleiten translates to “slope of the bishop”, named so because the vineyard was planted by the bishop of Trentino many generations ago. It is located on the western slope of Lake Caldaro. The vines are old and the wine is lovely. Other goodies include Santa Magdallener’s Huck am Bach, Caldaro’s Kaltereresee, and Baron di Pauli’s Kalkofen Lago di Caldaro. When purchasing schiava, go for the most current vintage and sip it often. There is enough to go around, and this is almost never a wine to age.